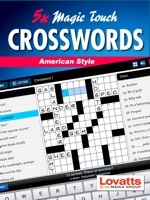 A sampling of 5 quality interactive crosswords in the distinctive North American style. This interactive book is packed with original features, including a handy Clue Bar which displays intersecting clues for easy reference. The Toggle Button allows you to navigate effortlessly between ‘Across’ and ‘Down’ and the Auto-Check function is a useful tool for highlighting letters entered incorrectly. There are unlimited Word/Letter Hints to ensure you’re never stuck and your progress on each puzzle is saved automatically for future completion. You can clear and solve each crossword time and time again. Brought to you by Lovatts Media Group, creators of the popular Magic Touch Puzzles series.